Although the Mission District is about to mark the 18th anniversary of a ban on new liquor licenses, it’s now easier than ever to get a cocktail in the neighborhood. Since the moratorium began in 1996, 156 restaurants have been licensed to sell beer and wine in the neighborhood, 39 restaurants obtained a full liquor license, two new bars have opened and three more stores sell beer and wine, according to data from the Department of Alcoholic Beverage Control. That’s because the ban restricts new liquor licenses but doesn’t prevent a business owner from buying a license from elsewhere in the city. Moreover, there are few restrictions on selling beer and wine. California law limits the number of bars, clubs and restaurants in a county to one for every 2,000 inhabitants. Stores selling alcohol are limited to one for every 2,500 inhabitants and stores selling beer and wine are limited to one for each 1,250 residents, according to Alcoholic Beverage Control. Some believe the Mission moratorium should be lifted, while others want to first have a community discussion. There are also residents and community leaders who believe the ban should be strengthened. “There’s a definite need to rethink some of it, because we’re seeing a shift in the Mission,” said Christina Olague, former president of the Planning Commission and now District 5 supervisor. Map showing the boundaries of the Mission Alcoholic Beverages Special Use District. Source: SF Planning Department. Officials put the moratorium, known as the Mission Alcohol Special Use District, in place in 1996 as a way to combat crime, noise and public drunkenness. For some, these issues remain today. Data shows that in 1995-96, there were 2,775 emergency room visits to San Francisco General Hospital that resulted in an alcohol-related diagnosis. From 2010 to 2011, the number jumped to 3,777, according to hospital figures. Alcohol abuse extends beyond those who can legally drink. “I see more kids with alcohol issues,” said Maria Salcedo, a case manager at the Central American Resource Center. Anyone who has issues with alcohol is at greater risk when surrounded by more establishments that sell alcohol, she said. 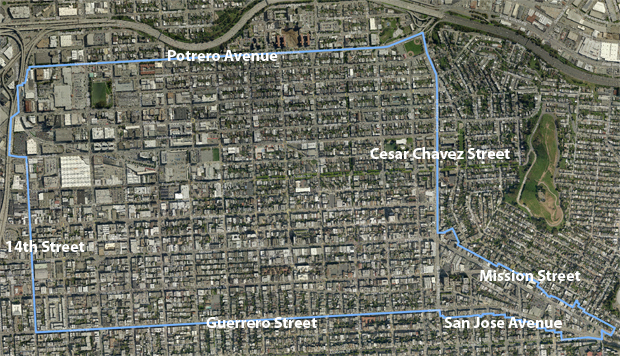 Others, including Supervisor Scott Wiener, argue that the moratorium no longer makes sense. The ban, he said, only encourages certain types of businesses. “We’ve freeze-framed the kind of business that can open. Why are we only encouraging full-service restaurants?” he said, referring to the fact that the ban doesn’t include restaurants. Some believe that range is already readily available. The Mission has more than 39 bars, 77 liquor stores, 13 stores that sell beer and wine, 68 restaurants with full bars and 226 restaurants that sell beer and wine. Recently, the Planning Commission approved a change in the moratorium that will allow the new bowling alley planned for 17th Street to serve alcohol. Another exception was made for the Roxie Theater. Both are in parts of the neighborhood where a drink is never more than a block’s walk away. Lifting the moratorium completely would mean even more places to drink in the neighborhood — an outcome that many believe warrants a discussion. “I can see that there is a way in which the moratorium is being circumvented, and I think that there should definitely be a discussion on how best to handle the issue,” Supervisor David Campos said when informed of the increase in beer and wine licenses. Without that community process, Campos said, he wouldn’t support lifting the ban. In the meantime, businesses opening in the Mission are finding ways to get around it. “A lot of restaurants are opening, there’s this whole foodie thing. It’s become the foodie capital of the West,” said Olague, adding that customers want to have the option of buying drinks when going out to eat. Some new restaurants are able to obtain liquor licenses through the transfer of existing permits. The soon-to-open West of Pecos, in the former Bombay Bazaar, was able to get a full liquor license transferred from Carlos’s Club on 24th Street. Tacolicious and Mosto, the bar within the restaurant, got a full liquor license transferred from Restaurant Cassis at 2101 Sutter St. At 777 Valencia, the soon-to-be Chapel Restaurant and Preservation Hall West got a full liquor license transferred from La Salsa restaurant at Pier 39. Mission Bowling purchased its liquor license from Jenny’s Restaurant and Bar at 1098 Sutter St.
To deal with the concerns, the Mission police station has added restrictions for new businesses. In the fall, the Planning Commission approved a full liquor license for West of Pecos only if the owners agreed to stop selling alcohol at midnight on weekends and at 11 p.m. Sunday through Thursday nights. However, bars on the same street stay open until 2 a.m. In 1996, Ray Balberan, who worked with youth at the Real Alternatives Project and is a recovering alcoholic, spoke out in favor of the moratorium. Today he thinks it should be strengthened. “I think [the moratorium] was really to cut back on corner stores popping up all over the place,” he said, adding that access to alcohol for youth is still a problem. Roberto Alfaro, an alcohol abuse counselor at the Mission Council who has been sober for 22 years, agreed. However, he believes availability of alcohol isn’t the problem. God, absolutely do NOT lift the ban! We swim in alcohol in this neighborhood and those of us who live here bear the full impact of it. I live here. I don’t mind. I’m on the fence about this one, both as a Mission resident & a bar manager (in a different part of town). As a resident, I lean towards being in favor of lifting, or maybe loosening the moratorium. While it’s true that there’s plenty of public intoxication, especially on weekends, it’s mostly Hipsters & good natured folks having a good time. Yes there’s a cost of trash clean up & street maintenance, but when you weigh that against the jobs & revenue from booze-selling establishments–it seems to even out. And there’s those of us who remember the Mission 10+ years ago: the street crime, prostitution & gang violence was rampant, & it would have never gotten better if it didn’t become the trendy neighborhood that it is today. As someone in the bar industry, however, I’m sort of in favor of the ban, believe it or not. Like the article states, SF is becoming this “Foodie Mecca,” and with that it’s also becoming more corporate. What were once considered trusted names & locally owned, I.e. Boulevard, Charles Phan, Bourbon & Branch, etc, are becoming the new corporate groups–with big budgets for PR, renovations, consultants, payroll, etc. As these groups continue to open new operations, it’s becomes harder & harder for real mom &’pop joints to compete. As someone who might like to have my own little joint someday, I like the idea that some of the little guys who own liquor licenses have the option of picking & choosing who to sell them to. If by “having a good time” you mean passing out on my steps, or talking loudly with no thought to anyone else who’s probably sleeping, or any other behavior I associate with inebriation, you can have it. I do think there’s a difference between adults sitting in restaurants having wine or beer (or single malt scotch, for that matter) with their dinner. Hipsters, as lovable as they may be, and bar habitues don’t seem to get that they are walking talking and drinking (lots of open container drinking in this stretch of 23rd Street) in a high density neighborhood with limited and shared aural space. I’ve lived here for twenty years and remember what it was like. Back then, the same behavior happened. We still have prostitutes and gunshots, all though less of the latter, maybe. Then it was offset by a smaller population. Now it’s a denser neighborhood and likely to not only stay than way, but grow. So what’s wrong exactly, with asking folks to moderate their behavior? And what’s wrong with moderating it upstream by limiting alcohol? As I said, we’re swimming in it. There are two liquor stores on both blocks from me and another to the West. We aren’t lacking. And to be clear, I mean: It’s legit to moderate behavior by limiting the availability of alcohol because of the spike in density and the projected growth in the Mission. Any full-service restaurant should be able to serve cocktails. Or at least beer and wine. It is an essential portion of a good business model. The moratorium on liquor stores selling to inebriates and minors, should, of course, stay in effect. I can’t see how the current ban is having any effect on alcoholism — people obviously have no difficulty by booze in the Mission. The only effect seems to be to make it more difficult to open up a bar or a restaurant. It is not clear that helps the neighborhood. Obviously some bars and some corner stores can be problems, but those should be dealt with on a case-by-case basis. Why not lift the ban, but make liquor stores not permitted? One of the reasons we don’t have groceries in the Mission is that they can’t get a liquor license because of the ban. 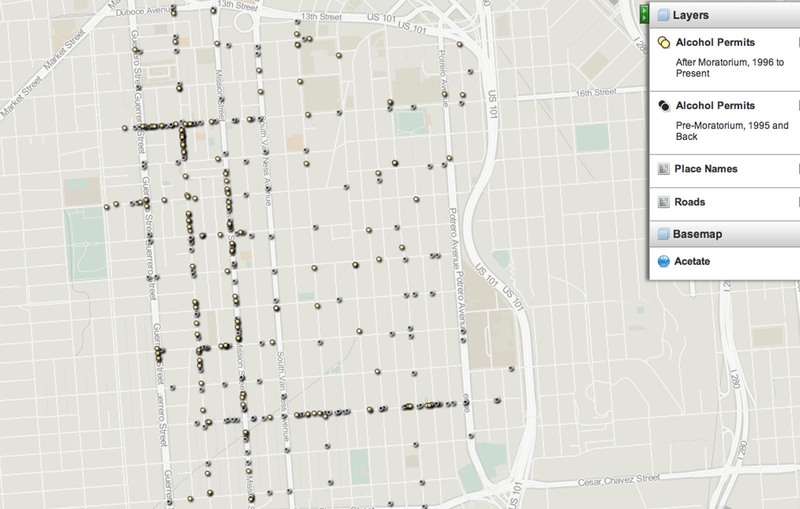 Since restaurants are exempt from the ban, we get a lot of restaurants; and they are increasingly high end because the ban drives up the price of liquor licenses in the Mission. Our neighborhood had a huge problem with Gas & Shop selling to any drunk or street person who would stagger into the place. There were people loitering in their parking lot, drinking out of paper bags, urinating, and vomiting. The good thing is it united many of the people who live around the business, we got the police and ABC involved, and eventually we brought enough pressure on Gas & Shop that they cleaned up their act quite a bit, though there are often people on the street drinking booze bought at Gas & Shop. The real problem is irresponsible corner stores who sell to any drunk who staggers in, and to people who will consume on the street. ABC and SFPD really stepped up, but it should be easier for them to take action against the “bad apples”. ABC in particular is notoriously understaffed. There should be an annual mechanism for input from the community that determines whether a license is renewed. As is, according to ABC, it’s nearly impossible to get an alcohol license revoked for a liquor store. You can only punish through fines and short-term shutdowns of alcohol sales. Nothing has had a bigger affect on our quality of life than reigning in this “bad apple”. I’ve complained to the ABC repeatedly and filed a complaint against a liquor store across the street from me- and after an initial phone call, never heard a thing from the State. Apparently, two ABC investigators went to the liquor store in question, once, and observed nothing. And that one “fact finding” mission was enough to satisfy them that the behavior I witness on a daily basis (fights, drug dealing, and open container drinking)wasn’t happening. Later, I spoke to an SFPD investigator. He suggested that one of the reasons the ABC doesn’t function or respond effectively as an enforcement agency is because the State, faced with rapidly vanishing revenue, is not eager to stop the flow of cash from the sale of alcohol. This may or may not be. I have no idea how much money California makes from the sale or alcohol nor how they make it exactly- I don’t think alcohol is taxed the way cigs are. I have to wonder though- why in heavens name are there only two investigators for San Francisco? That’s not simply understaffed, that’s MIA. Suki, this took the efforts of many people in a group that organized because we were sick of the impact this establishment had on the community. It was a lot of work to involve ABC, which is just not nimble enough to go after individual liquor stores. Ultimately, our group was able to gather some rather alarming video evidence that could not be disputed. If you have the ability video capture the offenses, you can really help ABC and SFPD. In our case, the offenses are were flagrant and frequent. It was easy to capture. The odds that a random ABC investigation lasting a couple of hours will capture what you see consistently is pretty slim. You have to help them out. I would also reach out to other people in your neighborhood and get them involved. Community pressure, rather than individual pressure, can get a lot more done. I have thought about the video camera approach- I just lack funds. The neighbors can be pretty apathetic. And (unsurprisingly) one does get tagged as a NIMBY for complaining. The situation has died down a bit, although if it starts up again, I might just bite the bullet and buy a camera! The problem with the existing “bad apples” is that they have been around for so long that they have unconditioned licenses. New licenses are routed by ABC through the SFPD’s Alcohol Liaison Unit, which puts conditions on the licences – size of bottles that can be sold, alcohol content, type of beverage, hours, etc. If the licensee violates any of those conditions SFPD and ABC have a mechanism to rescind the license. Exactly, Guerrero. It’s those unrestricted licenses that are the problem. Restrictions give SFPD the tools it needs to make an establishment responsible for its impact on a community. So why aren’t there any comments (other than this one) suggesting that SFPD actually enforce the laws around public drinking and being intoxicated and dangerous to others in public ? The liquor stores are only half of the problem. I don’t know- I wonder what we can do to hasten the police response every time I roust drunken hipsters open container drinking on my porch. I would love to see more enforcement. I wonder about foot patrols- a few SFPD on foot in the Mission might serve to calm things down and challenge the culture of open-container drinking that seems to have totally taken root. I hate militarizing the neighborhood with the SFPD, but there seems to be wide spread tacit acceptance of open container drinking and the non-stop Mardi Gras kind of behavior as just another feature of Mission life. And yet, 20 years ago, when the Mission was supposedly more “dangerous”, I didn’t see it as much. Randolph: relying on the SFPD to enforce drunkenness is like relying on them to enforce traffic laws on the overly wide, multi-lane streets of the Mission. Is speeding traffic on Potrero the SFPD’s job to constantly enforce, or should we look at redesigning Potrero to make it safer through engineering and other physical changes that will also make the street safer and more livable? Making this an either/or is a false choice. Yes, in your example – they should enforce the traffic laws AND the city should look at the redesign. In the Mission, public drinking laws SHOULD be enforced AND the liquor stores should be regulated and made to comply with the laws on the books.